American amusement parks are taking a bit of a breather this year. They don't have any record-breaking, holy-moly, you've-got-to-be-kidding-me, crazy-big coasters rolling out in 2017. That's not to say that there won't be any new thrill machines. There will. That's also not to say that the ones that are debuting won't turn your knuckles white and quicken your pulse. They will. It's just that America’s coaster class of 2017 won't reach the heights, speeds, or sheer audacity of some of the valedictorians from the past few years. Let's run down nine of this season’s most promising prospects. For its 15th entry, coaster-crazy Kings Island will unleash a traditional wooden ride. Mystic Timbers won't be as fast or nearly as long as the park's classic woodie, The Beast. But the 53-mph ride will include loads of airtime and one decidedly non-traditional element: Towards the end of the course, it will come to a stop inside a darkened building. Something will happen in there (likely, a special effects-enhanced scene), but for now the park is keeping it a mystery and teasing fans with the hashtag #WhatsInTheShed. Mine Blower at Fun Spot America in Kissimmee, Fla. Living in the shadows of Disney World, Universal Orlando, and SeaWorld Orlando, the small amusement park (which has a second location nearby in Orlando) has been quietly building up its collection of thrill rides and other attractions. In 2017, it will make a not-so-quiet blast with Mine Blower, an 82-foot-tall, nearly 50-mph wooden ride. The lead car will be adorned with large sticks of dynamite, and the train will enter darkened tunnels themed as mine shafts. Mine Blower will include a barrel roll inversion, a rare element for a wooden coaster. There are actually eleven most anticipated coasters for 2017 if you count the identical, Batman-themed attractions coming to three Six Flags parks as three separate rides. They will be clones of other "4-D Free Fly" coasters that have opened the past two years at other locations in the chain and have earned rave reviews. The Joker rides will climb 120-foot, 90-degree, elevator-like lifts and navigate multi-level ribbons of track that will include inversions and beyond 90-degree drops. Adding to the thrills, the trains' seats will be on the outside of the track and will randomly spin to and fro — or free fly in the fourth dimension as Six Flags characterizes it. It will only rise 61 feet and reach a top speed of 44 mph, but Wave Breaker's two magnetic launches should command attention. Its unique trains and seats, which will be designed to look like Jet Skis and approximate the feel of riding the vehicles, should offer a captivating experience. Racing above a lagoon, passengers will assume the roles of SeaWorld rescuers. GaleForce at Playland's Castaway Cove in Ocean City, N.J. The coaster coming to the seaside park was supposed to open last year, but was delayed. It will use magnetic motors to launch its train forwards and backwards three times. On the third try, GaleForce will ascend a 125-foot tower and freefall beyond 90 degrees down the other side. Rollin' Thunder at OWA in Foley, Ala. The new amusement park scheduled to open this summer on the Gulf Coast will include a couple of other, smaller coasters, but Rollin' Thunder will be its headlining attraction. Like the similar Thunderbolt that debuted in 2014 at Brooklyn's Coney Island, it will climb a vertical lift hill (passengers should make sure that they empty their pockets), drop straight down more than 100 feet, soar through a 98-foot loop, and deliver other inversions along its out-and-back route. InvadR at Busch Gardens Williamsburg, Va. Dropping 74 feet and accelerating to a relatively modest 48 mph, most visitors should be able to handle the thrills that the wooden coaster will deliver. Located in Busch Gardens' New France section, InvadR will sport trains themed to villagers and invading Vikings. 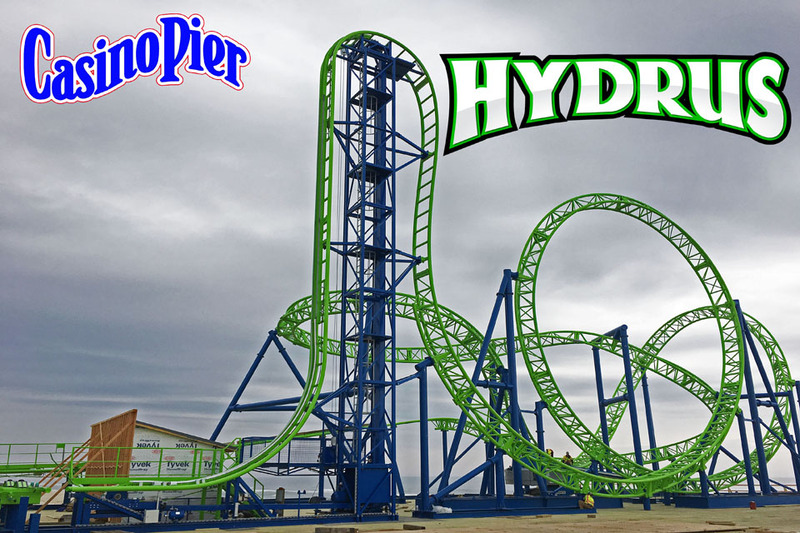 Hydrus at Casino Pier in Seaside Heights, N.J.
Castaway Cove won't be the only Jersey Shore amusement area to get a new coaster this year. The compact Hydrus at Casino Pier will climb 72 feet straight up, drop a beyond-vertical 97 degrees while hitting 45 mph, and encounter three inversions. Merlin's Mayhem at Dutch Wonderland in Lancaster, Pa.
Dutch Wonderland is designed for children 12 and under. So it's no surprise that its new ride, an inverted coaster, will only have a 39-inch height requirement. It will climb 60 feet, include two helix turns, and go easy on the thrills. Bonus: The tenth most anticipated coaster for 2017 isn't a new coaster. It is actually a bunch of existing coasters that will offer the option of onboard virtual reality experiences. Last year, Six Flags scored a major coup and introduced VR overlays on one coaster at each of its parks. The reviews were mixed. Some enjoyed it. Others reported longer wait times, so-so graphics, and technology snafus. For 2017, the park chain will offer new VR experiences at all of its parks. It recently announced that, starting in February, The New Revolution Galactic Attack would be available at its two California locations. Magic Mountain in Valencia will offer it on The New Revolution looping coaster, and it will be on the inverted Kong coaster at Discovery Kingdom in Vellejo. Calling it "mixed reality," Six Flags says the science fiction- themed VR experiences will allow passengers to see the real world as well as the virtual one while riding the coasters. At SeaWorld Orlando, riders will be able to don VR goggles and encounter the mythical ocean beast, the Kraken, aboard the ride that bears its name. The intense floorless coaster climbs 149 feet, reaches 65 mph, and includes seven head-over-heels inversions.